First ubiquitous in brewing, then obsolete, barrels are once again on the leading edge of the craft beer movement. Until the mid-20th century, all beer was stored and transported in barrels—usually made of oak because of its sturdiness and waterproof quality. Industrialization of the brewing industry changed all that; metal tanks, glass bottles, aluminium cans, and stainless steel kegs became the norm, and wooden barrels all but disappeared. Perhaps the only exception was in Belgium, where a unique brewing tradition involving purposeful cultivation of wild yeasts and bacteria in beer kept barrel aging alive. Craft brewers throughout North America are now barrel aging some of their beers, and beer drinkers are getting very excited about the results. Like wine, some barrel-aged beers can benefit from further aging in the bottle for a year or more. Brewers have even taken to sealing barrel-aged beers with wax to encourage and support aspiring beer cellarists. There are two main ways to look at how barrels are used in craft brewing: barrel fermentation of Belgian sour styles such as lambics, gueuzes, and Flanders red ales; and barrel aging of potent styles such as imperial stouts and porters, old ales (or barley wines), and strong Belgian ales. Sour beers spend years slowly fermenting in barrels contaminated with organisms that would ruin traditional beers, so they are challenging for brewers. 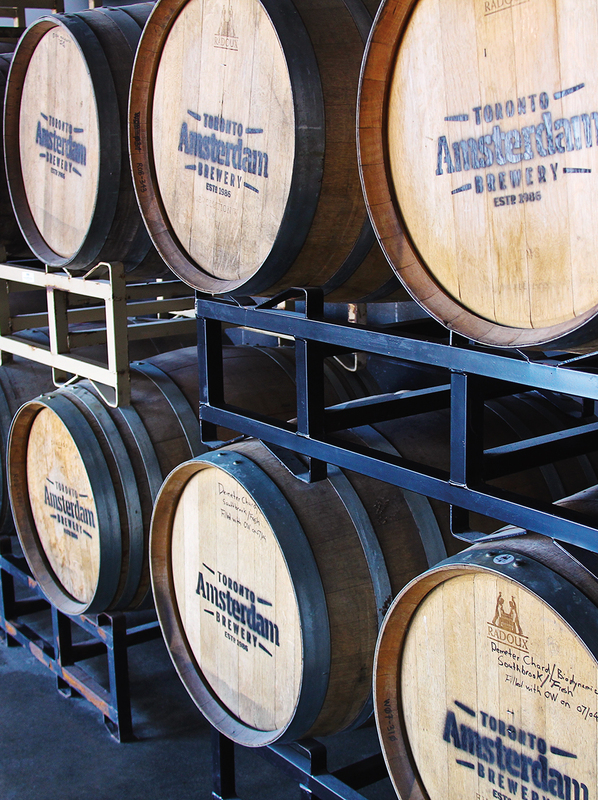 Barrel aging, depending on various factors, can be much easier and less expensive. It usually involves a bourbon barrel, and there is essentially an endless supply of used ones available to brewers: by definition, every new batch of bourbon must be aged in a brand new, freshly charred white oak barrel. “All you’re trying to do is essentially pull out the flavour of the barrel—the tar and bourbon flavour,” explains Jason Meyer, one of two founding brewers at Victoria’s Driftwood Brewery, which has been barrel-aging beers for the last three years. Brewers want barrels for sour beers to be contaminated with funky yeast (Brettanomyces) and bacteria, so they reuse them on purpose, often without cleaning them out. Depending on the style, fruit may also be added along the way to encourage refermentation. Amsterdam has also collaborated with three other Toronto breweries (Indie Ale House Brewing Co., Great Lakes Brewery, and Sawdust City Brewing Co.) to produce a beer called Niambic, which is based on the Belgian lambic style. Last October, the brewers put fresh wort (beer before it is fermented by yeast) in open fermenters outside in a Niagara vineyard right next to an orchard. The goal was to let wild yeasts and bacteria from the grapevines and fruit trees inoculate the beer, and hopefully give it a unique flavour—the ultimate in local terroir. “We hope to be doing that every year over the next three years to the point where we can blend,” McOustra says. With many sour beers, brewers blend different vintages together to create the ideal flavour profile. Barrel aging is part of Quebec’s burgeoning craft beer scene as well. Dieu du Ciel!, which has a brew pub in Montreal and a microbrewery in nearby Saint-Jérôme, releases five barrel-aged beers every year—with plans to release two more this year—and has a sour beer program underway. Probably best known for its Péché Mortel, an imperial stout infused with coffee and aged in bourbon barrels, Dieu du Ciel! also ages some of its beers in pinot noir barrels. Breweries all across Canada are adding barrel-aged and barrel-fermented sour beers to their regular lineups. But are they for everyone or just beer geeks?